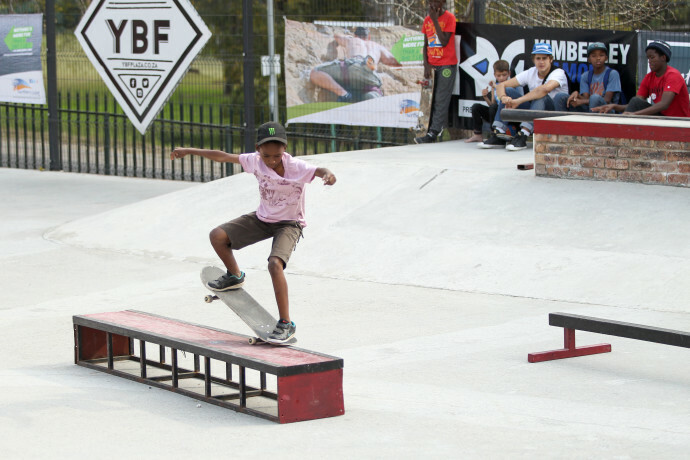 The fourth stop of the Skateboarding For Hope Supported By DC Shoes National Tour went down on Saturday, 28 May at YBF Skatepark in the Johannesburg suburb of Bryanston. 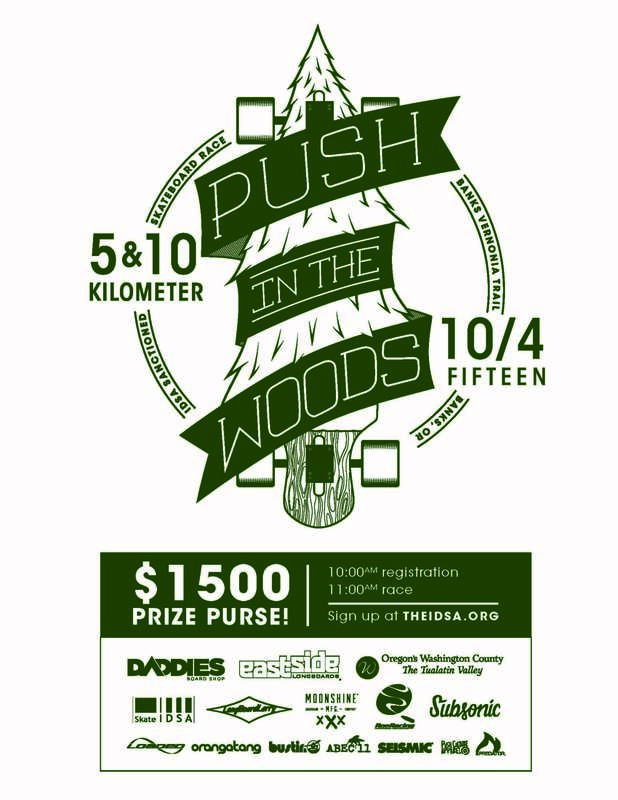 Heaps of local skaters came out to show support and rip for their share of cash and product prizes. 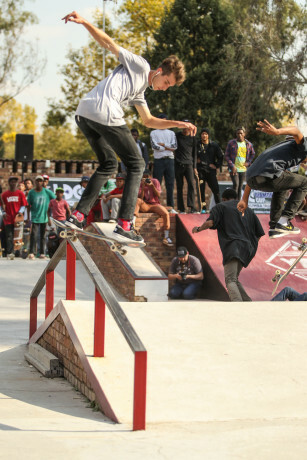 We were joined by inner-city Johannesburg skaters organized by One Love Skate Expo who were stoked to mission out of the city to skate some new terrain and check out some of the JHB area’s most rippingest rippers. 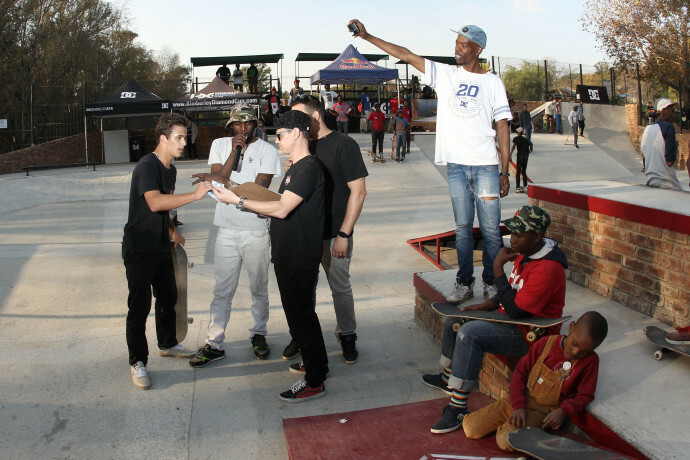 The crew left with fresh complete skateboards and some of them even enetered the contest. 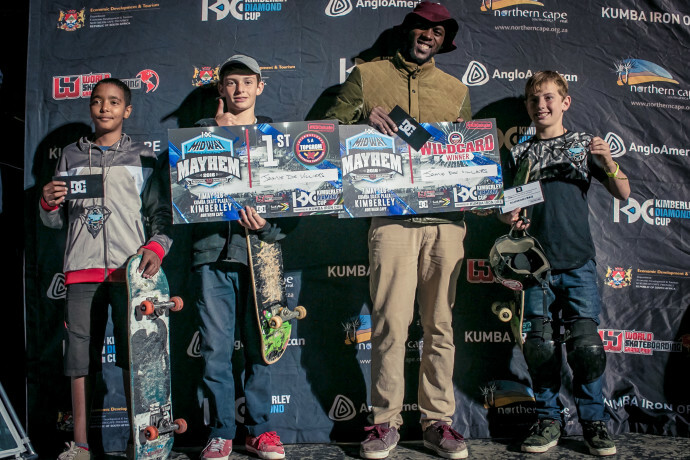 Lehlogonolo, one of the Drill Hall locals, even won in the TopGrom division! Smiles all aorund from that crew. 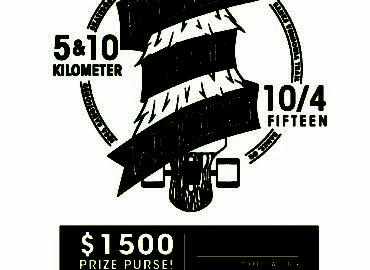 With a jam-format contest for the TopGrom (13-) division and a tricks for cash for the older guys, there was plenty of opportunities for anyone who could bring it to come up on some cash or product prizes. The level of skating for the 13- crowd was the highest we’ve seen all year at this point. Tristan McLennon was putting together some smoothe runs all day, as were the Stylianou twins and young Ashton Banwell. One Love rippers Terrence and Lehlogonolo definitely surprised the crowd and came through with some Jozi flavour that got everyone stoked. 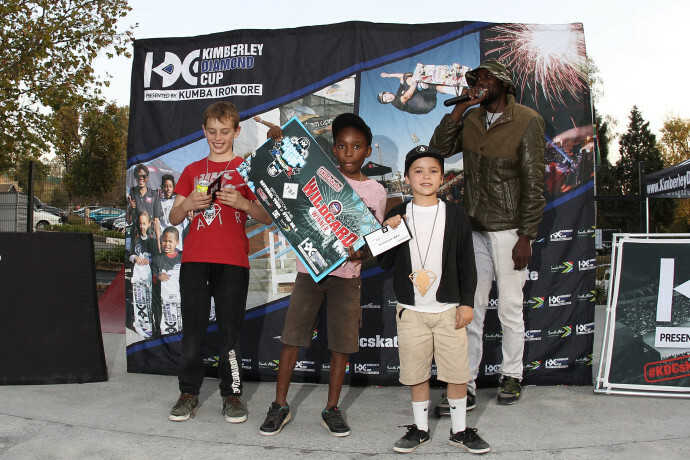 We can’t wait to see what the TopGrom Championships at KDC this October has in store for us! The tricks for cash jams for the 14+ crowd got a little too hectic with all the bodies everywhere, but it allowed everyone to bring their own tricks to the table. 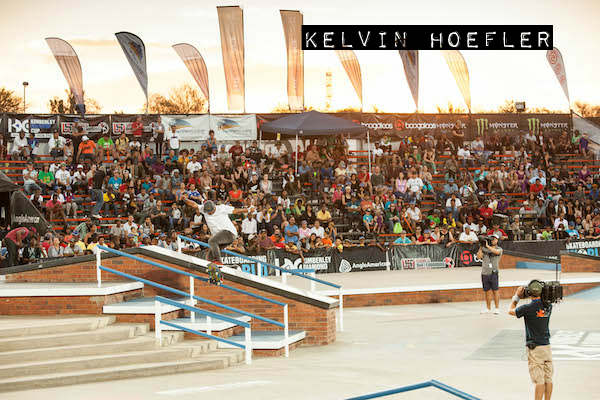 Some of the standout tricks of the day that we saw were definitely TK Modise and Trae Rice’s destruction of the vert wall; with a back D by TK and a nosepick and lien to tail by Trae, the whole skatepark was going nuts! Props are also due to German transplant Tabo Lochelt who murdered the stair section with a nollie front feeble, switch 270 to frontside boardslide, and a switch fs 360 down the stairs. Tabo is a machine! Stay tuned for the video to see more of the ripping that went down. Thanks to YBF Plaza for hosting us and thanks to One Love for making sure we had a good crew of kids to hang with for the day! 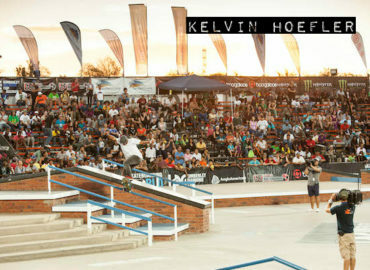 Thanks to all our sponsors, partners, and organizers that made things happen: DC Shoes, Northern cape Tourism, Kumba Iron Ore, WSF, World Skateboarding Grand Prix, Red Bull, Pragmatics, and Old School Productions. Our next stop is through the Northern Cape on 2-5 June, hopefully we’ll catch you out there! Skate For Hope! 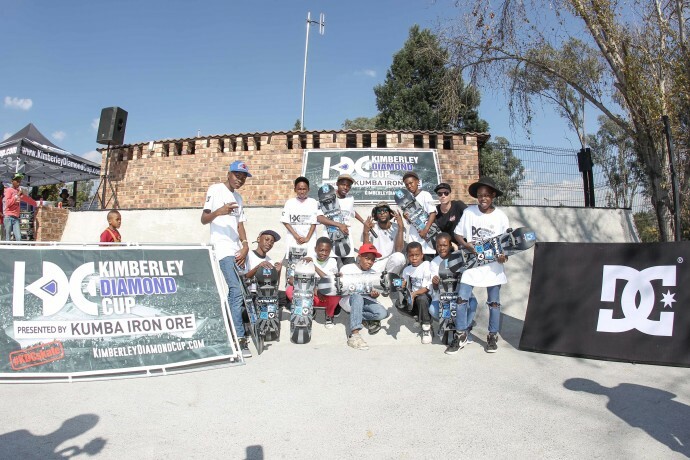 The kids from One Love Skate Expo that skate the Drill Hall space in downtown Johannesburg made it out to the event to skate with us and even left with new completes. Most of them even entered the TopGrom contest! these kids rule. thanks to Quincy and Refilwe for making sure the kids made it out safely! The Drill Hall kids were loving the park. 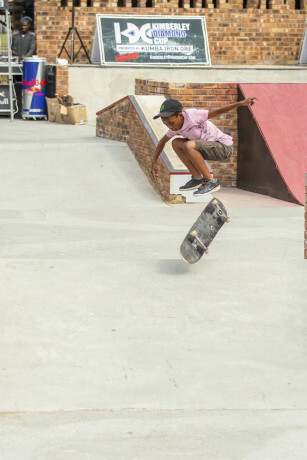 Lehlogonolo scoops a varial heel on the A-Frame. Young Ashton Banwell comes through with a front board. Terrence with a kickflip down the stairs, this kid has just got it! 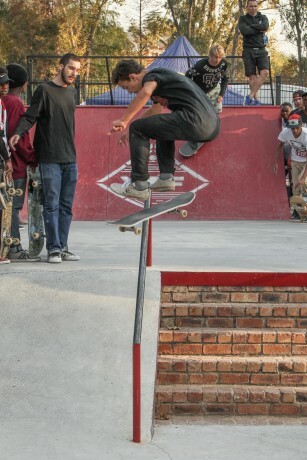 Nosegrind from Lehlogonolo. 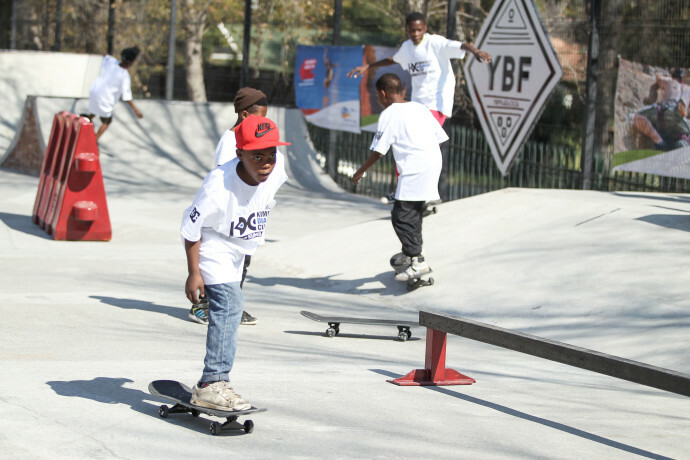 This kid skates the streets of Johannesburg every day and doesn’t have regular access to a skatepark; but had no problem adjusting to YBF. He definitely shines on the ledges. Tristan was killing it in the TopGrom division contest all day. Boardslide. 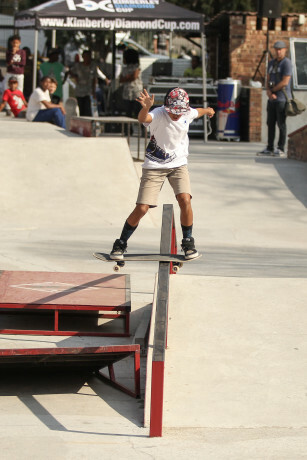 Brandon Ramos backside lips on his home turf. The Tricks For Cash jam on the A-Frame (and all of the obstacles, really) got a little too wild. Ramos-induced pile up at the bottom of the rai. 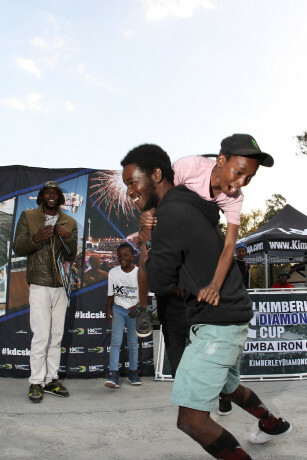 TK Modise mans up to a beast of a back D on the vert wall and took R100 for his efforts. Daniel Miltiadou with an early grab wall smash. Watching Danny Boi cruise the curves is always a sight to see. Trae Rice comes through with a boneless to lipslide for Brian Anderson. Taylor Sturgess just floats these switch shuvits and stomps them down when the time is right. Taylor kills it! Brandon Valjalo, kickflip frontside board. A go-to move for B-Valj. Brandon comes up on some cash. Lehlogonolo! Quincy was so hyped for his boy. 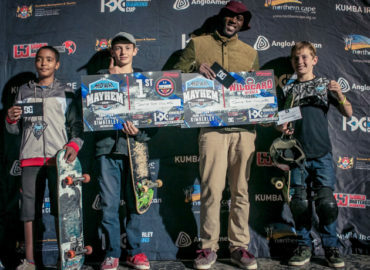 Brian Stylianou (2nd), Lehlogonolo Thom (1st), and Ashton Banwell (3rd). The post Skateboarding For Hope Supported By DC Shoes: YBF Skate Plaza (JHB) appeared first on Kimberley Diamond Cup.